It's nice to see Josh Holloway getting work again. But it'd be more enjoyable if Intelligence was less of a copycat. 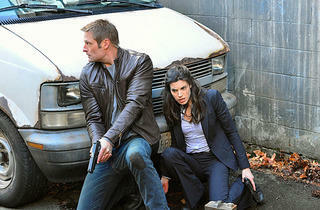 Photograph: Chris Helcermanas-Benge Intelligence premieres Tuesday, January 7 at 8pm on CBS. Despite the popularity of Lost and the fans that salivated for Josh Holloway's Sawyer, the actor hasn't done much since the show's end. Perhaps his most notable appearance was as a spy with a super-powered contacts in Mission: Impossible — Ghost Protocol. The creators of Intelligence may have watched that scene a few too many times as this new action series borrows a lot from Mission: Impossible, not to mention Fringe and even the spy comedy Chuck. Long before he was an intelligence asset, Gabriel Vaughn (Holloway) was a decorated soldier. But due to a unique genetic mutation, Gabriel proved to be the perfect candidate for a government program dubbed Clockwork. Now, in addition to being a soldier with combat skills, Gabriel has a chip in his head that pipes an unlimited data plan with access to any and all information straight into his brain. He’s like a robot, but more emotional and a lot harder to control. It’s because of this that Lillian Strand (Marg Helgenberger), the head of U.S. Cyber Command, has swiped Special Agent Riley Neal (Meghan Ory) from the Secret Service and tasked her with protecting their human computer from himself and others. Of particular interest is Gabriel’s fixation on finding information about his wife, Amelia (Zuleikha Robinson), a black-ops CIA operative who is believed to have turned on her country before dying in a terrorist attack. Gabriel, however, doesn’t buy this story and, while she keeps up a good poker face, neither does Strand. Intelligence isn’t the first television show to try the chip-in-the-head secret agent plot on for size. NBC’s Chuck and SyFy’s Canadian import Continuum have both tread this ground. The latter having already offered up most of the aspects of the fictionalized technology that Intelligence seems most proud of. 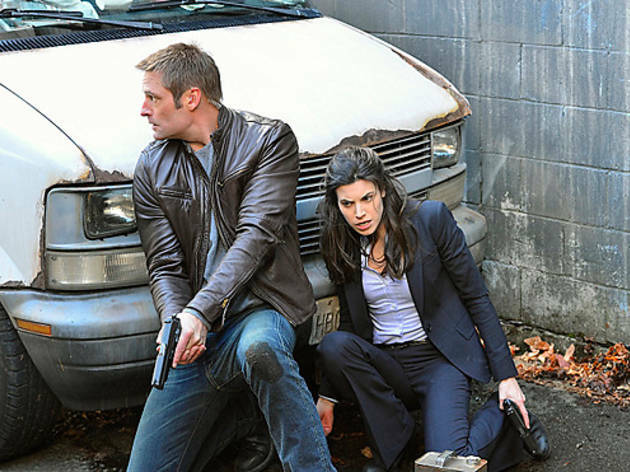 The aspect of Gabriel’s chip that the show is most enamored of is his ability to visualize a virtual crime scene in which he can walk around and investigate. It makes for a nifty effect but doesn't add a whole lot to the rest of the show. Holloway and Ory have decent chemistry, but none of the characters in the show are particularly interesting. The series seems like it's been cobbled together from pieces of other shows and movies and resulting product is not equal to the sum of its parts. As entertainment, Intelligence is passable, but a weightless and forgettable clone.